What’s .NEXT 2016 – All Flash Everywhere! Prism Central and NOS 4.5, NCC 2.1, Foundation 3.0 and MORE Tech Preview Features – What’s New! Goodbye Dual Controller Arrays. Hyperconvergence meets All Flash. NOS 4.1.3 – What’s New! Prism Central and NOS 4.1.4, NCC 2.0.1 and Acropolis – What’s New! NOS 4.0 – When is it safe to upgrade the hypevisor? Nutanix One-Click Upgrade now takes care of Firmware and Hypervisor too! Being called out on Exchange performance & scale. Close (well not really), but no cigar. Nutanix - Get To Know Us! Flash – Performance at what cost? Unlimited VMs per datastore? Its not a myth with Nutanix! Storage DRS and Nutanix – To use, or not to use, that is the question? Nutanix Controller Failure. Will Users Notice? Is Hyper-Converged faster than SAN? Data Locality matters… a LOT! See this video demo. Nutanix Autopathing – The search for the MAGIC! Why Nutanix is a Webscale architecture ? How to Architect a VSA , Nutanix or VSAN solution for >=N+1 availability. New PRISM Central One-Click Upgrade and One-Click Smorgasbord! Not just Hypervisor Agnostic, Hypervisor Version Agnostic! New Nutanix Erasure Coding & How it works? What’s .NEXT? – Scale Storage separately to Compute on Nutanix! What’s .NEXT? – Erasure Coding! Scaling Hyper-converged solutions – Compute only. What I/O will Nutanix Erasure coding (EC-X) take effect on? What if my VMs storage exceeds the capacity of a Nutanix node? Hardware support contracts & why 24×7 4 hour onsite should no longer be required. Is updating @VMware ESXi at @Nutanix really that easy? Can't delete a Nutanix datastore? Is VAAI beneficial with Virtual Storage Appliance (VSA) based solutions ? Can I use my existing SAN/NAS storage with Nutanix? Rule of Thumb: Sizing for Storage Performance in the new world. How to Size Nutanix Capacity… the Unofficial Calculator! VirtualBoy : Did you run Nutanix Cluster Check (NCC) ?? NCC - The Swiss Army Knife of Nutanix Troubleshooting Tools. VirtualBoy : Nutanix TechTip 2 : Trigger Automatic NOS download instantly in Prism web console. SATA on Nutanix. Some experimental data. Nutanix Acropolis – Hypervisor STIG – Don’t make security a point in time. What are the VDI options for Nutanix Acropolis Hypervisor? It turns out I was wrong. Nutanix already has a Java SDK! Citrix MCS on Nutanix AHV: Unleashing the power of clones! PVS and AHV powershell wizard. SQL*Server on Nutanix. Force backups to HDD. Who runs Horizon 6 more efficiently? Nutanix or VSAN? Installing and configuring Citrix XenDesktop on the Nutanix computing platform! VMware Horizon View 6 + Nutanix: Full Clones? No Problem! Virtualizing Business Critical Applications – The Web-Scale Way! How cool is your virtual desktop? SuperScalin': How I learned to stop worrying and love SQL Server on Nutanix. Linked Clones with Shadow Cloning VS. Full Clones w/ Native VAAI Cloning? Are PoC and Pilot no longer required for VDI deployments? Nutanix & Citrix… A match made in heaven. In 30 minutes we will tell you why! How to Configure Nutanix Volume Groups to Support Windows Failover Clustering (Part5) Additional Considerations. Nutanix CE is Now Available to All and it’s FREE! Step by Step running Nutanix Community Edition on VMware workstation. Nutanix CE (Community Edition) – home lab. Deploy Windows Server 2012 R2 Using #Nutanix CE Image Configuration Service. Where does Nutanix fit in with my OpenStack environment? Why build OpenStack Cloud using Nutanix Acropolis? 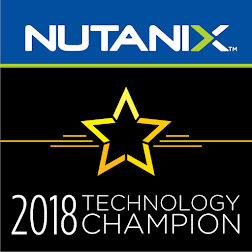 Being a Nutanix (NTC) Technology Champion... What is it all about? Hyper-Convergence is a Commodity. Now What?! The All-Flash Array (AFA) is Obsolete! Do you have a vCenter plugin? Fight the FUD: vCenter on VDS on Nutanix NFS Datastore – Not a problem! Ignore the nonsense on twitter, What does “NoSAN” mean? Nutanix support on vSphere – No Bull! The truth about Storage Data efficiency ratios.